Hello. This is the story of Gofdu Farm, Penrhosfeilw, Holyhead. This farm was in the Williams/Roberts family for well over 150 years. It still stands today proudly surveying the Irish sea to the West and Snowdonia to the South. The history takes us to the late 1960s, when the farm was sold out of the family; but for those who remember it as children it retains its nostalgic magic. It has taken many years of research to discover the origins of the family, but it is, of course, incomplete. I welcome any suggestions, corrections or additions. Your input and comments will be very welcome. The coastline of the small island of Holyhead on the north-west tip of Anglesey is as beautiful and rugged as any other in Britain. Historically known as Holy Island, it is separated from the main County by a small tidal river that can sometimes be crossed on foot at low tide. Those who do stay, or those who make a trecking tour of the island will actually find scenery of spectacular beauty, especially on the western coast. Our story concerns this particular part of Holyhead, and especially the area known as Penrhosfeilw, just south of South Stack Lighthouse, and the south-western base of Holyhead Mountain. Penrhosfeilw starts, more or less, at Porthdafarch Beach, which, with Trearddur Bay a few kilometres to the south, is said to be among the most beautiful in North Wales. The cliffs along the coastline are impressive and dangerous. They’re not particularly high, probably averaging 30-40 metres, but they drop directly into the sea below. 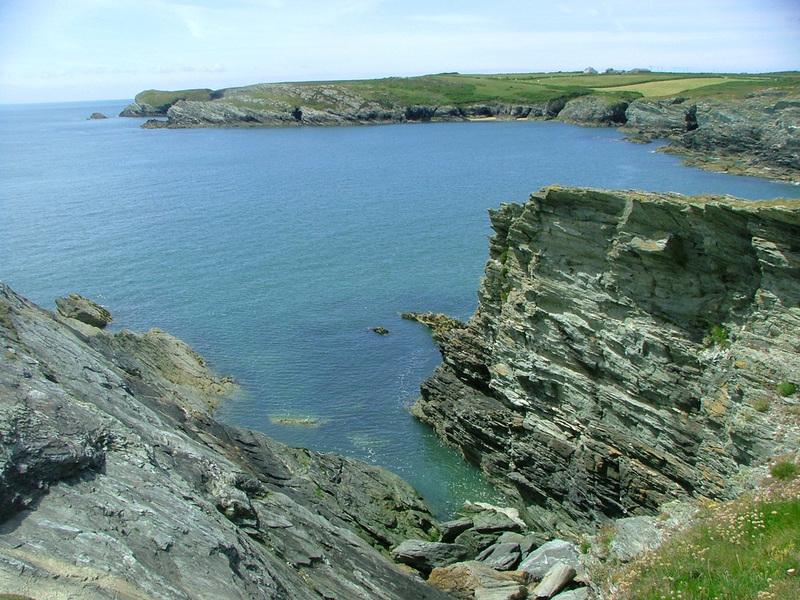 A few hundred metres along the coast north-west of Porthdafarch is a small cove. At the cliff base is a beach, visible only at low tide. It’s very small, probably only 15 metres wide by 20 metres deep, and at the back is a dark, black cave, seemingly hidden inside the cliff . This cave has been known for generations of those who know of its existence, by its Welsh name, Gof Du, literally ‘black cave’, and it probably gave its name to the farm that stands about 200 metres away. This farm has been the literal and spiritual home of the Williams/Roberts family for over 200 years. Our story begins in 1813, with the marriage of Hugh Williams and Mary Lewis, of Plas farm, Penrhosfeilw. The wedding took place on Sunday, November 28, 1813, at St. Cybi’s Church, Holyhead, after one publication of banns. Although it would seem to be insignificant, this “one publication of banns” was to have consequences 80 years later, when the legitimacy of their eldest son John was brought into question in a London court. We know this from newspaper reports of the court proceedings, and it confirms that Gofdu farm existed at that time and that Hugh Williams was a tenant. When the farm was actually built is not known but we can hazard some guesses as we continue with this story. It is important to note, however, that the building was not the one we know today. Rather it was a single storey cottage, most likely of only two rooms, as was the custom in those days. The building that is familiar to us was built sometime in the 1880s. The original cottage was converted into a pigsty, which stood for many years opposite the stables. John Williams, the eldest boy, was born two months after the marriage. We don’t know the exact birthdate, but the baptism occurred at St. Cybi’s on 8th January, 1814. Hugh and Mary had 8 children. After John came Richard born 1815, William born 1818, Elizabeth born 1826, Hugh born 1830, Thomas born 1833, Owen born 1836 and Eleanor, born 1839. Eleanor died when she was three. First though, John, the eldest son, with some exceptions, spent most of his life working the farm at GofDu. He didn’t marry until 1872, when he was 58 years old. His bride was Susannah Williams, one of 10 children of Hugh and Mary Williams, of Llanfair-yn-Eubwll, near Valley. There was a 32-year difference in ages. (Note that John and Susannah both had parents named Hugh and Mary Williams, a fact that has caused complications for family historians over many years). They had one child, also named Hugh, who was born on January 2, 1873. Elizabeth, too, spent most of her life at the farm while the other children moved elsewhere. Their brother Richard went to sea and became a naval captain, eventually retiring to live in Bangor. He died intestate on September 5, 1878, leaving considerable personal property. Fifteen years later, William and Elizabeth decided to make sure that their nephew Hugh, who was then nearing 21, should not inherit anything from the estate, and took the issue to the Chancery Court in London to rule on the legitimacy of their eldest brother John. Gofdu Farm looking across from the clifftops just south of Porthdafarch. Photo courtesy School of Natural Sciences, Bangor University. This is a transcript of the Denbigh Herald story. The Liverpool Mercury story is substantially similar. ﻿A CASE ﻿which excited interest in Holyhead was decided last Monday, in London, before Mr Justice Stirling, having reference to a Gofdu family at Penrhosfeilw. It appears that in November 1813, Hugh Williams, the then tenant of Gofdu, married Miss Mary Lewis of Plas, Penrhosfeilw, after one publication of banns at the Holyhead parish church of St Cybi. There were several children of the marriage, the eldest was John, who was christened at the same church in the month of February, 1814. Both the wedding and christening took place on a Sunday. He continued to reside at Gofdu until his death, and had married Susannah Hughes, at the same church, on the 14th June, 1872. There was one child only of this marriage, called Hugh Williams, and he and his mother resided at Gofdu up to the present time, the husband having died on the 27th February, 1878. A brother of John Williams called Richard Williams died intestate in Bangor, on the 5th September, 1891, leaving considerable personal property, and letters of administration to his estate were granted to his sister, E. Williams, of Boderw, Penrhosfeilw, upon which it became necessary to ascertain his next-of-kin entitled in distribution of his estate. So a brother of his called W. Williams, of Rock-street, Holyhead, took proceedings in Mr Justice Stirling’s court for that purpose. In those proceedings, Elizabeth Williams endeavored to prove that her eldest brother John was illegitimate, having been born, as she alleged, born before wedlock, though in the baptismal certificate he was described as the son of Hugh and Mary Williams, of Gofdu. The result of this, if proved, would, of course, be to bar any claim of Hugh Williams, his son, to a share of the property of Richard Williams. Hugh Williams, being an infant, had, according to the rules of the Court of Chancery to get a next friend to consent to act for him before he could appear in court, and Dr Roland Williams did so. Several affidavits were filed on both sides, and the matter came on for hearing some weeks ago, before Mr Romer, the chief clerk attached to Mr Justice Stirling's court, and he on the 3rd of January last gave his decision in favour of the legitimacy of John Williams and, therefore, of the infant Hugh Williams. Against this decision Elizabeth Williams appealed to Mr Justice Stirling, who last Monday confirmed the decision of Mr Romer. The result of this is that Hugh Williams is declared one of the next-of-kin and heir-at-law of Richard Williams, and also heir-at-law of his father John Williams and his grandfather Hugh Williams, and as such entitled to a share of the personal property and part of a freehold property called Boderw, and its rents now received by Elizabeth Williams. — Mr J. Lloyd Griffith was the local solicitor acting for Elizabeth Williams, and Mr E. G. Roberts for the infant Hugh Williams. There is a major inconsistency in the above story and it relates to the word “infant.” Hugh Williams was not an infant in 1893 - he was 20. Because he was under 21, the then “legal age” Hugh could not appear in court by himself. He had to be represented by a “next friend,” in this case Dr. Roland Williams. Dr. Williams was a prominent member of the Anglesey County Council, a member of the Holyhead Board of Guardians, and deputy-coroner for the county of Anglesey. We now know that Richard Williams, John’s younger brother, was born at Gofdu in 1816. He doesn’t appear in any of the censuses for Gofdu that I can find, but I have discovered the notice of administration of his Estate. A search of the 1891 Census for Bangor shows Richard Williams, aged 75, living as a boarder at Vron Oleu. He is described as a Retired Sea Captain. £1,115 was a lot of money at the time and this was a substantial estate. For instance, a comfortable house in Anglesey could have been purchased at that time for £40. It is almost certain that Richard owned Boderw farm and that his sister Elizabeth was probably living there. She was at least collecting the rent. Elizabeth doesn’t appear in the Gofdu censuses after 1871 - in fact she seems to vanish from the record, as does the name Boderw farm, as it doesn’t appear in the 1901 Census. From this distance in time the legal action against the young Hugh Williams seems vindictive, but it’s not clear what the motive was. Elizabeth seems to have been the main instigator of the action as she appealed the original decision to grant the young Hugh a share of his uncle’s property. Hugh would have been entitled to his share of the estate on attaining 21 years of age, specifically January 8, 1894. Could it have been jealousy or resentment at Hugh’s mother Susannah, who was 20 years her junior? Elizabeth had spent most of her life at Gofdu, but suddenly her brother John marries a woman 32 years younger than himself, and she becomes head of the household - surely a recipe for tension. Not only that, within four months of John’s death Susannah had married a neighbor, William Roberts, with whom she had 5 children. In fact, as recent research has shown, Susannah married again after William’s death. For now though, let’s go back to the history of the farm. Gof Du, like all the surrounding farms, was part of the Penrhos Estate, owned by Owen Stanley, a rich philanthropic landowner who was something of a legend in Holyhead throughout much of the 19th Century. At this point a brief history of the Stanley Estate may be pertinent. In 1553, Edward VI's reign, Penrhos was granted to John-ap-Owen (also known as John Derwas). At this time, the land consisted of little more than the Penrhos headland upon which a farm was built, originally known as Tudor House and subsequently, Penrhos. The estate was the seat of the principal land and property owners on Holy Island for over 400 years, passing into the hands of the Stanley family following the marriage of Margaret Owen to Sir John Thomas Stanley in 1763. He also made a lot of money during the town’s explosive growth in the mid 1800s. It’s thought that he began developing the area named Penrhosfeilw (for which there seems to be no adequate translation) soon after the construction of the South Stack Lighthouse in 1808-09 which stands on the summit of a tiny island 30 metres off the north-west tip of Holyhead. It was built after years of petitions from British and Irish merchants to allow safe passage for ships on the treacherous Dublin - Holyhead - Liverpool sea route. A new road had been built from Holyhead to the island around the southern base of Holyhead Mountain to transport material to the site. Not long after, another road was built from Holyhead to Porthdafarch Beach, about three miles to the south, after the construction of a Customs house on the north side of the beach, a structure that still stands. As kids we used to think pirates gathered at the hut before taking to sea to raid passing ships!! A north-south road was later built between Porthdafarch and South Stack, completing the circle. Porthdafarch Beach has also played a big part in the family history, and I’ll cover that later. Construction of the farms at Penrhosfeilw coincided with a surge in population growth in Holyhead as a consequence of the construction of Britain’s largest breakwater. The breakwater is 3 kilometres long and protects Holyhead’s outer harbour. Work began in 1845 and took 28 years to complete. At one time 1,300 men were employed at the works. They came from all parts of Wales and Ireland to work on the project, and Holyhead grew from a relative backwater to a prosperous town within a few short years. Between 1841 and 1851 the population of Holyhead rose from 3,869 to 8,863. Owen Stanley owned most of the land around the then small village, and sold large tracts for housing. I believe the Williams family were the original occupants of Gofdu – Hugh, his wife Mary and children John, Elizabeth and Hugh, and it is known from the court records regarding the paternity case that they lived there in 1813. Hugh was a native of the town, having been been born there in 1781, as was Mary, born in 1791. In fact Hugh may very well have been living at Gofdu before his marriage. The wedding certificate states that Hugh Williams and Mary Lewis were married by banns at St. Cybi’s church, Holyhead, on the 28th of November, 1813. The paternity court case says that Hugh Williams was the then tenant of Gofdu when he married Mary. They may well have both been living there as Mary was 8 months pregnant when she married. As stated above I don’t know the exact birth-date of John Williams but according to the baptismal records of St. Cybi’s Church in Holyhead, he was baptised on 8th January 1814. This contradicts the newspaper report of the court proceedings, which stated that he was baptised early in February 1814. Since birth records were not kept at that time perhaps there was more to the illegitimacy case than might at first appear. The 1851 census has them living at Gof Du together with Ann Williams, aged 14 described as a servant and pauper. There is no indication that she was related to the family. The original Gof Du farmhouse built by the Stanley Estate was quite small, more like a cottage of about three rooms, nothing like the large house that stands there today. It would have been extremely small for three people, let alone the eight who lived there at the time. Whoever the original tenants of Gofdu were, it would appear that the tenants of the Penrhosfeilw farms may have been given a building and virgin land and encouraged to improve it, acre by acre. Starting a farm from scratch is a difficult task at the best of times, and is very capital intensive. We have no information about the actual builders of the property, or whether Hugh Williams was the original inhabitant, but it could have coincided with the construction of the South Stack lighthouse. There was a large construction workforce in Holyhead at that time. However, Dad says that over a long period of time the soil would have become degraded because of overuse. The only fertiliser available was farm manure, and this would not have been sufficient to adequately recover a farm of Gof Du’s size. It wasn’t until after the Second World War, when the government gave assistance to farmers to buy fertiliser that the soil at Gof Du improved. In general the Penrhosfeilw farms stocked dairy cattle, providing milk to Holyhead. They also grew vegetables, which were sold in the town, and corn to sustain the animals over winter. Owen Stanley built a market hall in Holyhead so that outlying farmers could sell their wares. Gof Du families would have been regulars at the market. When I was 13 I went to the market each Saturday morning to help at the market’s largest fruit and vegetable stall. I used to walk home with as much produce as I could carry, plus about 5 shillings for the day’s work.